Finally! The Brunei issue of the Joint ASEAN 2007 was finally launched in Brunei Darussalam, a few months late. 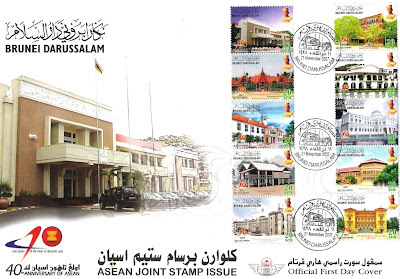 Brunei is the last country to issue the Joint ASEAN 2007 stamps. The other 8 did it, I think, last August. Myanmar was the 9th and Brunei is the last. Nothing much to talk about. The stamps are the same as the other stamps issued by the other ASEAN countries which I have talked about in the past. The Brunei's stamps are printed by Security Printers of Malaysia using unwatermarked paper of 102gsm. The perforation is 14 per 2 cm. The stamps are all 20 cents denomination, so it will be used quite widely. We designate a substantial portion of our revenues to be awarded to groups seeking funding for projects in Antarctica. We have donated money to the Students on Ice Program to send high school students to Antarctica via Argentina and will probably continue to make grants to this program. We makes grants as far as tax deductions allow us and are working on expanding our revenue base with other similar items to increase revenues further and attain our goals faster. We are always interested in applying the newest technologies to produce colorful, well made and technologically advanced collector's items that will grace the finest collections. We hope you will consider a purchase of our products. Our collector bills have been sent to Antarctica several times for orders and they are known of there. We have shipped to many countries and US states. We have received many mentions in national and international collector publications. This is one of the last two notes which I bought recently. 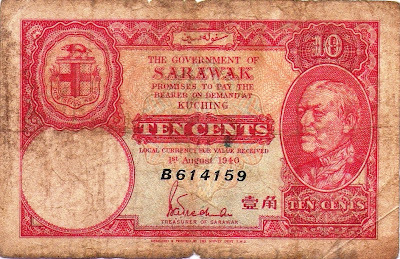 This one is a Sarawak 10 cents note which was issued in 1940. The condition is not so good and I got a good bargain for it - I guess nobody else wanted it - not in that condition anyway. This particular note is an emergency issuance during the Second World War. Remember, practically most British related currencies were printed in England. During the War, metal was scarce and paper notes were issued instead of metal coins. 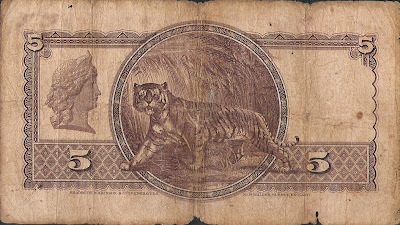 This is the only Sarawak paper coin that was issued during the War. There were other paper coins but most were issued very much earlier on. I came across this article on a University of Calgary website about the use of Straits Settlement coins in Calgary Canada about 100 years ago. The original link is here. The article is written by Don Sucha. Canadian Numismatic history is full of examples of the use of foreign currency in daily commerce. French, Spanish and American coins were widely circulated in Canada in the years before, and immediately after, Confederation. To this day, it is not unusual to find the odd American coin in one's pocket change. This presence of foreign currency often led to some very complex, and creative, methods of determining both exchange rates and preference of payment. The common practice of Maritime merchants listing their goods and services as "payable in Spanish Dollars" and the exchange rate known as the "Halifax Currency" (1) are two examples. Although most of the above-noted events took place in the Eastern provinces before Confederation, Western Canada has not been immune to similar situations. Early in 1906, the merchants of Calgary were embroiled in a controversy which threatened to severely cut into their profits: Calgary businesses were accepting coins from the Straits Settlements (part of modern day Malaysia) at face value - but the banks were not. At some point in early 1906, Calgary merchants had begun accepting some foreign silver at face value. Some very enterprising Calgarians, noticing that Straits Settlements coins were amongst those being accepted, started buying up the foreign coins in Vancouver (where they were readily available) at half their face value and circulating them in Calgary, thus incurring a 100% profit on their venture (2). This had the effect of flooding the Calgary market with Straits Settlements coins. By February, the Calgary banks estimated that there was anywhere between $10,000 and $20,000 in Straits Settlements coins circulating in Calgary, mostly in 10, 25, and 50 cent denominations (3). To put this amount into perspective, in the same month, Calgary City Council was trying to pass a bylaw allowing it to borrow $30,000 to upgrade its electric system (4). The amount of Straits Settlements coinage in Calgary represented a significant portion of the economy. The Straits Settlements coins of the time were not unlike those of their Canadian counterparts. Straits Settlements coins were issued in the same denomination as Canadian coins, they were about the same size, and their obverse even bore the same portraits as Canadian coins. They were, in fact, struck at the same mint as many Canadian coins, the Heaton Mint in Birmingham (5). It is interesting to note that the two Straits coins which were dissimilar from their Canadian counterparts - the 20 cent and 5 cent coins - were,apparently, not imported to Calgary for circulation. However, there was one big difference between Straits Settlements and Canadian coins: their respective Silver content. Canadian silvers coins of the day were .925 silver whereas the Straits Settlements' silver content was only .80 (6). It may have been this discrepancy, along with the cost of handling the large amount of foreign coins, that led the Calgary banks to devalue the exchange on the Straits Settlements coins to 50% of face value. The Calgary merchants soon followed suit. On February 28th, the retail section of the Calgary Board of Trade passed a resolution that Calgary merchants would only accept Straits Settlements coins at 50% of their face value (7). Merchants and individuals still holding Straits Settlements silver were now faced with a 50% loss in their holdings. It was hard to keep a secret in Calgary in 1906: the week before the Board of Trade meeting saw a huge increase in the amount of Straits coins being passed. There was even an increase in the amount of Straits coins landing in the collection plates of Calgary churches the Sunday following the resolution. Reverend George Kirby, the charismatic preacher at Central Methodist Church, admonished his congregation for placing the Straits coins in the collection plate. Regardless, his church had to deal with over $17.00 worth of the devalued currency that one Sunday (8). But why were Straits Settlements coins accepted at face value in Calgary in the first place? Usually, the answer would be a coin shortage.When a country, or region, is faced with a shortage of circulating coins, the normal response is to either strike local tokens or use foreign coins. It was coin shortages in pre-confederation Canada which resulted in both the production of tokens and the use of foreign coins. Although there is no real mention of a coin shortage in Calgary at that time, there are a number of social and economic factors present which would seem to point to that conclusion. The growth of Calgary has always been characterised by cycles of "boom and bust" and, in 1906, Calgary was in the midst of the greatest population boom of its history. The population had grown from 4091 in 1901 to a whopping 11,967 in 1906 (9). It is possible that the population may have been even higher. On March 30, the Calgary Herald announced the population of greater Calgary as 20,000. The population of Calgary was growing at a rate of as much as 15% per month. This was due, in large part, to an influx of American immigrants; the so-called "U.S. Invasion". This rate of growth put a great strain on all aspects of the Calgary social structure and infrastucture. It is logical to assume that there would have been an even greater demand on the supply of circulating coins as well. We also know from newspaper reports that, at the same time as the Straits Settlements fiasco, the Calgary banks were calling in all circulating American silver and sending it back to Ottawa (10). It would appear that, in Calgary in 1906, there was a situation similar to the "American Silver Nuisance" of 1870 which resulted in the government both the buying up of American silver and the introduction of 25 cent fractional notes (11). It is also interesting to note that the Calgary Straits Silver situation coincided with the construction of the Royal Canadian Mint, a project which had its own share of controversies. A number of Calgary coin dealers and collectors have told me that, when they first became involved in Numismatics, there was a great deal of early 20th century Straits Settlements coins still available to collectors in the city. However, in Calgary today, Straits Settlements coins from that period are relatively hard to find. Regardless, these seemingly insignificant coins, from a small area in the Pacific, played a dramatic, if brief, role in the history of Calgary. 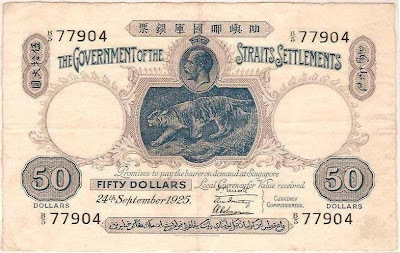 About a few weeks ago, I had this entry about the $10 note of the Straits Settlement currency. That $10 was a good note and I was lucky to get a good price for it. My latest acquisition is the $5 note which for US$70 is not in a good condition as the $10 note. 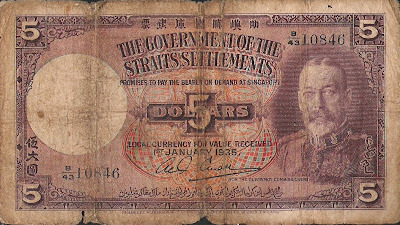 This $5 note was issued in 1935 and printed by the same printer. The series of $1, $5 to $10 are the most affordable. Anything beyond this, is also beyond my price range.